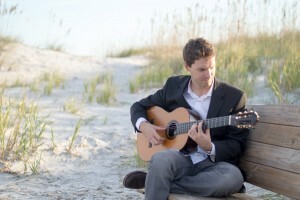 Justin Hoke is a professional wedding musician located in Wilmington, NC. Whether you need beautiful acoustic classical guitar for your wedding ceremony or a one-man rock band for your private party, Justin will deliver with style, experience, reliability, and unbeatable customer service. His musical styles include classical, rock, folk, jazz, pop, country, blues, and more. Justin can accommodate any special song request and can perform in any location (from the beach, to the bar, to the concert hall).